Personalized Pickle Barrel - - The Amazing Pickle Barrel™ for pickling almost anything. 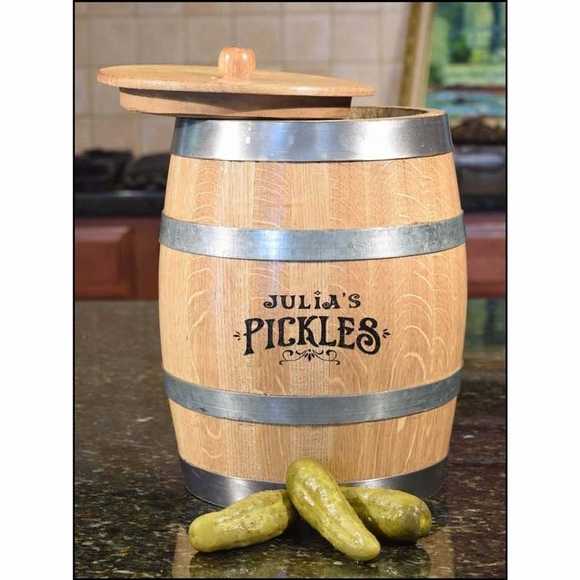 Personal size pickle-making barrel includes essential recipes for making sweet pickles, spicy pickles, and dill pickles. 9.5" high mini-barrel barrel is handmade from carefully selected American white oak and lightly toasted to bring out the inherent flavors of the wood. The wood flavors and pickling spices you use are likely create the best pickle you have ever tasted. Since each stave of wood is different, the flavor profile varies from pickle barrel to pickle barrel (and from wine barrel to wine barrel and from whiskey barrel to whiskey barrel). Dimensions: 6.5" diameter x 9.5" high. The Amazing Pickle Barrel™ personal-size pickle-making barrel for pickling almost anything.